To check out our Aboriginal Affairs and Northern Development profile click here The AANDC profile has audits,population,census info and ect. The Sandy Bay Ojibway First Nation is situated on Reserve No. 5, a 16,456 acre site on the western shore of Lake Manitoba. It is 165 kilometers northwest of Winnipeg and 90 kilometers from Portage la Prairie. The reserve is accessible by all-weather roads via provincial highways #16 and #50 north from Portage la Prairie.. Approximately three quarters of this land is committed to farming. Located in the lowlands with a gentle rise westward from Lake Manitoba, most of the shoreline along the lake consists of a fine sand beach bordered by Balsam Popular and Trembling Aspen. A bog and marshland run alongside and into the lake. At the time of the signing of the treaty, Sandy Bay was called the White Mud Band, separate from the Portage Band of Chief Yellow Quill. 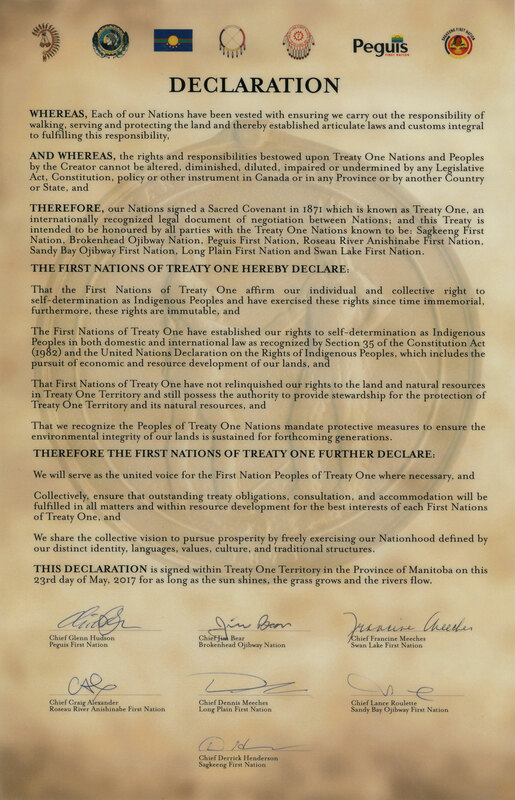 It was a treaty after wards, the signing of treaty 1 of 1871 and in 1876 that settled the present location. The first chief after the treaty was Nawachegapow. Townships 17 & 18 were then granted to the band. Sandy Bay does not have any more outstanding treaty land entitlements. Some of the economy for Sandy Bay Ojibway First Nation comes from and includes; farming for livestock and various crops that are maintained by local Sandy Bay farmers. Our people of Sandy Bay, have been a role model in keeping and speaking fluently in Ojibway. There is about an 80% average of Ojibway speaking community members, thus keeping our language alive. POPULATION TO DATE The total registered population of Sandy Bay First Nation as of July 2013 is 6174. With Sandy Bay's ever growing population, the birth rate now stands at 8-12 births a month. Not included in the population figures, are the non-aboriginal members on reserve. Sandy Bay's original roots began after the signing of Treaty 1, in 1870 in Portage la Prairie, Manitoba. In 1871, the Ojibway/French mixed-bloods of the Portage Band requested a reservation be set aside for them, the request is accepted, but the Half-breeds were required "...to move North, not nearer than 20 miles" where the town of Westbourne is now located. The new half-breed reserve is named Whitemud. In 1873, the reserve and its members are relocated again. This time straight North. In 1877, the residents of Whitemud are told to move again after the surveyor told them he made a mistake. This time just one mile southeast where Sandy Bay currently is today. 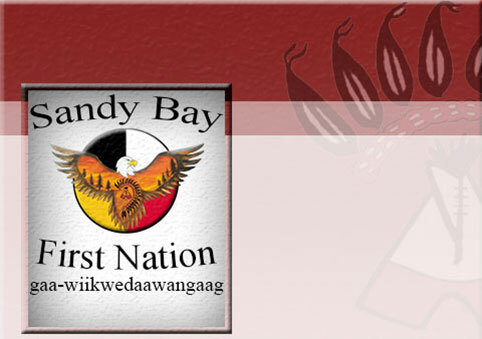 The Ojibway/French mixed-blood reserve is renamed Sandy Bay. On July 21, 1884, Sandy Bay had its very first elections. Francois Demarais wins and is the first elected Chief. Baptiste Spence and Wah-sah-hook win for the councillor positions and are the first councillors. The Sandy Bay Reserve started with around 180 people of mixed-blood ancestry, having taken up farming. Where the Sandy Bay Band found itself, farming proved difficult, if not impossible. Crops and livestock were frequently lost to flooding. In 1880 the Band's request for a change in the reserve boundaries to high ground was denied, with the counter-offer for a move to equally unacceptable land. Despite three consecutive years of flooding, the Band preserved and planted a variety of crops. By 1885, wi18th some respite in flooding, Band members had built 40 houses and 25 stables, and had 23 horses, 69 head of cattle and 20 acres under cultivation. Then the flooding begin again, and the Band pleaded to withdraw from Treaty No.1 and return the reserve to the government in exchange for "scrip", individual land title or money. The history of the exchange of land for scrip is clouded. In July 1885, the Indian agent told Band members that mixed-blooded people could withdraw from the treaty and be entitled to scrip or land ranging from 160 to 240 acres in size. At an ensuing meeting, the agent was said to have set the restriction that anyone who had even a drop of white blood would not be entitled to annuity payments. Most Band members were of mixed ancestry, and they also were worried that elderly widows would not be allowed to receive scrip. The agent, who had brought a man named Sifton wi19th him who offered to exchange trading good for the value of scrip, said that those who choose to withdraw from the treaty would receive $50 for their share of the reserve. Many Band members felt they had no choice, so they took the scrip and immediately sold it for goods. Within a week, their names were struck from the annuity list. The apparently sharp practices of the agent were reviewed by an inspector named McColl, who declared that "The trumped up grivences are manufactured by designing interested parties or are the inventions of the half-breeds themselves after they squandered proceeds of the scrips or their claims thereto." Whether his finding was just or not cannot be confirmed, but historians of the event observed that "The inspector reveals the prejudices common to his profession. That is, that the grievances presented by Indians are trivial and instigated by "troublemakers." The agents, on the other hand, are presumed to be acting in good faith and telling the truth." Moved to poor land unfit to till and forced by desperation to surrender it, perhaps by means of a swindle, the people of Sandy Bay faced even worse circumstances. The reserve was depopulated, and by 1886, in effect, was closed. Those who had stayed went to Portage La Prairie, the Long Plain and Little Saskatchewan reserves. A few remained in houses scattered along the lake shore. In 1887, when the Indian agent came to make the annuity payments. "only an elderly man, Kahweetahpenais, and a crippled widow named Caroline Spence came forward." The following year, representatives of the Band petitioned the government for assistance. They were turned down on the grounds that it had been their choice to withdraw from the treaty. Eventually, Band members slowly drifted back to the reserve, and by 1890, the Band asked that the reserve be reinstated. This time, the government responded by re-admitting the Band to the treaty with the value of their land and scrip to be deducted from their future annuities. By 1895, houses and stables had been built. Band members planted potatoes, hunted, fished, dug for senaca root and made sleighs, carts, harnesses, and snowshoes to support themselves. By 1912, the records indicate that they were several successful grain farmers on the reserve. French and English explorers and traders encouraged Indians to join the fur trade economy by opening new fur-producing regions for the Europeans. Accepting that encouragement, they used the river systems, moving both east and west in search of better hunting and trapping. As this happened, relations with other tribes along the routes were altered. This occurred between the Ojibway and the Dakota tribes, who shifted between alliances and warfare. By the mid 18th century, the Ojibway had forced the Dakota from their settlements around Sandy Lake, Cass Lake, Leech Lake, and Red Lake, to what now is Minnesota. They then turned their attention to the region along the Red and Assiniboine Rivers, from which the Dakota had launched raiding parties. The area was abundant in game and fur-bearing animals, and to the west were vast herds of bison and elk. The Ojibway started moving into the region in the late 1770s. If they were attracted by the region's resources. Their migration was made easier by an outbreak of smallpox, which ravaged the Cree and Assiniboine living on the fringes of the area, weakening the ranks of their warriors. The Ojibway did not escape the disease, but its effects were not as great. 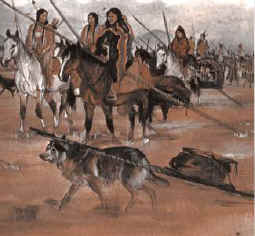 One historian speculates that this may have been because they "had access to an abundant and reliable supply of wild rice," and could " support a large number of children even if the hunters were ill." A second factor that encouraged the Ojibway to move to the plains occurred when the Cree abandoned trapping to provide food to the trading posts, mainly buffalo meat in the form of pemmican. The Ojibway stepped into the void, encouraged by the trading companies. By the early 19th century, the Ojibway began to undergo a metamorphosis that would turn them into Plains Ojibway, an ethnic group distinct from their Woodland Ojibway ancestors. They left behind many of their woodland customs, and began to adopt the buffalo-hunting lifestyle of the plains tribes. The hide ti-pi replaced the birch bark home of the Woodland Ojibway, and the birch bark canoe was replaced by the travois pulled by dogs or horses. The soft soled moccasins was replaced by one with a sole, which offered better protection against grass stubble and the prickly pear of the plains. Women stopped weaving and making pottery, and turned to the production of hide utensils and clothing. The Ojibway religion was modified by elements of belief and ritual from the Plains tribes. By the time Canada had become a nation, the Ojibway were a people who had demonstrated a willingness to deal with the "White Man." And who were prepared to pursue their interests vigorously and, if necessary, to fight to secure them. The pressure of European colonization had forced them from their eastern woodlands; economic necessity, war and disease contributed to moving them further west and transforming their way of life. Beyond all else, they showed they were tough and resourceful, capable of surviving through adaptation. By the 1860s, the Ojibway had met many difficult challenges. Arguably, greater ones were to be before them.